I try to make one of my daily meals a salad and I have to admit, I’ve been in a not unpleasant but not particularly exciting rut: nice lettuce, grape tomatoes (if I have the heart to buy tomatoes out of season) and cucumbers with one of those dressing mixes you make in a cruet that my mom got me addicted to and I am only somewhat ashamed to admit to. I might add some cheese, some walnuts and cranberries, red onion, but don’t really vary it much. Sometimes I make the major move of opening a can of chick peas (we call them garbanzos in Spanish) and add some. The other day though, I remembered how easy it is to make garbanzo salad and how long it lasts in the fridge getting tastier and tastier. A scoop of this salad (a slight variation on Molly Katzen’s version in The Moosewood Cookbook) adds spice, texture and protein to an otherwise boring salad (and eliminates the need for dressing). I also take it to BBQs and other potluck affairs where I know there will be plates and forks. It is also really nice mixed with rice and eaten cold. I named my version for Greta Garbo because the name lends itself rather obviously, but also because it is distinctive, has a subtle and intriguing spiciness, has ginger (for her ginger hair) and because no one can ever leave it alone. Place chick peas, ginger, and red onion in a medium bowl or plastic storage bowl with a cover. In a small bowl mix the oil, vinegar and lemon juice with a whisk or a fork until emulsified (blended together). Pour dressing over chickpea mix and stir to coat. Cover and refrigerate. It’s best made at least a day ahead, but you can also make it on the fly and it will be delicious. Gets better and better over the next week. This looks and sounds yummy! 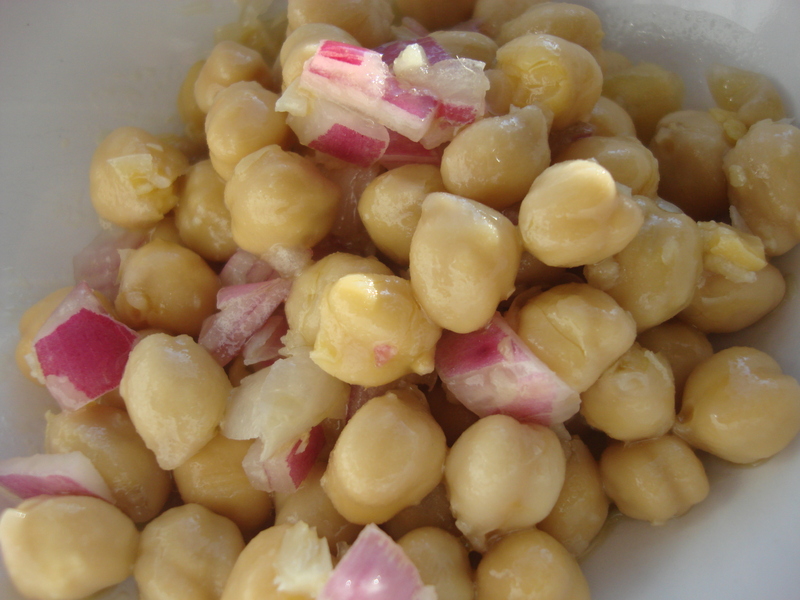 I usually make a chick pea salad with red onion, olive oil, lemon, oregano, salt and pepper.. I really like the idea of adding ginger root! I love the garlic and ginger together…wonderful combination! This looks great- and love chick peas. thanks for sharing- I’ll probably omit the onions (not a huge fan) but otherwise, I love the idea of adding it to salads to spice it up. Awesome. I highly recommend this recipe. I ate this quite often when i was pregnant and my child arrived beautiful and my hair shone and my skin sparkled. Yum! This sounds great! I’ve used various Italian herbs in a variation of this, but never ginger. Can’t wait to try it! I have never included ginger, but have made a similar salad many times, adding finely diced tomato, a squeeze of lime juice and some chopped yellow/red/orange (whatever I have really) pepper. Can never chop the red onion too fine or mash the garlic too much. Nice side!